Desmond, what's the one thing I tell you the most? The one thing? No! You stand up for what is right! 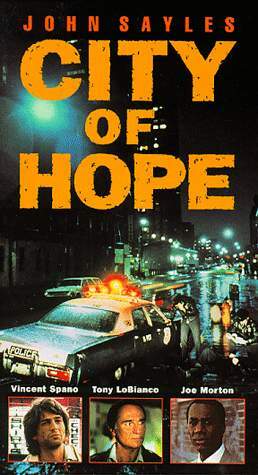 "City of Hope", John Sayles' 1992 film that is considered his best work, takes place in the fictional Hudson City in New Jersey, concentrating on the lives of its residents, playing itself out like a working class slice-o'-life Bruce Springsteen song (incidentally, Sayles has directed a number of music videos for the Boss). The canvas that Sayles paints on is large, with an excess of thirty characters to keep track of, from streetwise kids to police officers to smalltime hoods to the mayor himself. There is Nick (Vincent Spano), a shiftless young man that decides to walk off the cushy union job on his father's construction site and ends up pulling an electronics store heist to cover the debts he owes. Joe, his father, owns several slum housing projects and is being pressured to dump them by the mayor's office to make way for the Galaxy Towers, a Japanese-backed condominium development that the Mayor hopes will revitalize the city. The night of the electronics store heist, Nick runs into Angela (Barbara Williams), a single mother, divorced from her cop ex-husband, Mike, who used to beat her. Mike, has it in for Nick because of his involvement with his ex-wife, and it is only the efforts of his partner, Patty, that keep him from doing something stupid. There are two black kids, who after being hassled by Mike and Patty, decide to beat up the first white person they see, a professor at the local university. After the kids are arrested, they concoct a countercharge that the professor was homosexual and was making advances on them. This brings in the involvement of Wynn (Joe Morton), a black alderman who finds himself caught between the white establishment and the black militants in his constituency, in not only the mugging incident, but also the Galaxy Towers development. There is Carl (John Sayles), a crippled body shop owner that sends Nick out to do the electronics store heist and does the occasional 'favor' for Joe. There are dozens of other characters, too numerous to mention, but you get the idea of the level of convolution found in COH. You want me to give your program free computers? You understand that I don't get them free from the manufacturers. If these people don't have money, then they're not likely to be my customers, right? COH is very similar in many respects to Sayles' most recent work, "Lone Star"-- an ensemble character drama that takes place in a specified geographical area. The sense of community is conveyed by the fact that in Hudson City, everyone's actions has repercussions on the lives of others-- the interconnectedness of the residents, despite their disparate economic and racial background. The decision of the boys to concoct their countercharge has repercussions on both the black community, who see it as a rallying point against the 'enemy' at City Hall, and the white community, who are concerned about the rampant crime in their city. In order to protect his son from an outstanding arrest warrant, Joe makes a deal with the mayor's office which results in the death of a young woman and her baby, relatives of one of his domestics. However, unlike LS, which portrayed the continuum between past and present via seamless transition shots for the flashbacks, COH portrays the city as a seamless spatial continuum. The camera is omnipotent, floating around the city, capturing moments in the lives of the various characters as they cross each other in the streets or eat at the same restaurants. It is quite something to see, as different plot points are discussed by different characters in the same room, made possible by stream-of-consciousness camera work (another film that utilizes this approach would be the Japanese film "Tampopo"). Two people are dead because of you and me. That's what trespassing does... those are the kind of people accidents happen to. The conclusion of the film is open-ended, and you may feel 'cheated' by the lack of resolution when the final fade-out occurs, and the closing credits roll. There are some winners who manage to make a stand for what is right for the community and maintain their idealism despite the 'system', and there are also some losers, who sink into the pit of self-interest, compromise, bribery, and despair. But like life, problems are never really solved. It is an ongoing struggle to stand up for one's ideals, without resorting to the temptations of corruption or escape. For Hudson City, hope lies in the community coming together to preserve these ideals, because what you do to 'them' today, will eventually come back to haunt 'you' tomorrow. And that's what we're voting for tonight... the best. The best for our children. Or do we sell out their futures for a few tax dollars?